Hello my loves, long time no blog no? Well Here I am coming back to you, I'm on vacation for the next few days, my laptop is still broken so I'm using alternative computers until it's returned to me. In the meantime I wish to clean up my book~lists a bit so I'm joining in on the Bout of Books 8.0 challenge running from Monday August 19 to August 25th. 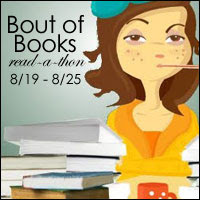 Check out their blog Bout of Books for a list of fun challenges, twitter chats, and more information. Here's my list of books to clean up this week. I'm desperately behind on reading this week so here's hoping I can make a dent in these.